Cannon County had two state winners Sunday in the Tar Wars Contest at the Embassy Suites in Nashville. Taylor DeArmond, 5th grader from WGS, placed 2nd in the entire state. The 2011 Tar Wars winners for Cannon county are in: Woodland Elementary Austin Taylor and teacher Angie Fann, East Side Elementary Lauren Underwood and teacher Greta Reed, Short Mountain Sadie Hall and teacher Brad Underwood, West Side Julianna Schau and teacher Lynn Gragg, Auburn Elementary Logan Young and teacher John Dorris, Woodbury Grammar School Taylor DeArmond and teacher Robbie Prater. Tar Wars is a national anti-tobacco campaign sponsored by the American Academy of Family Physicians. Tar Wars began in 1988 and reaches approximately 500,000 students annually. personal responsibility for their well-being. Approximately 2% of elementary students, 18% of high school students and 22% of adults use a tobacco product. If a person smokes one pack of cigarettes a day at approximately $5 per day, he or she will spend $35 a week, $150 a month and $1825 a year. If a person smokes for fifty years, he or she will spend $91,250 in his life time. All local 4th and 5th graders had the opportunity to hear the Tar Wars presentation and participate in the poster competition. 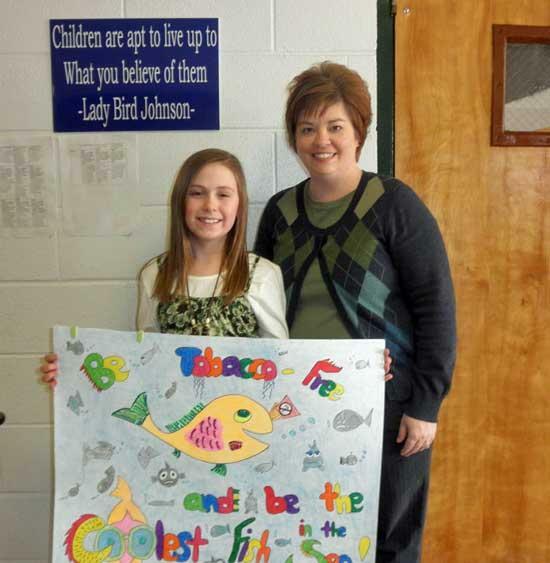 Each elementary school chose one poster winner. The local poster winner received prize money and their poster went on to the state competition in Nashville. The state winners receive a trip to Washington, D.C. and participation in the national competition. The national winner receives a trip to Walt Disney World or $3000. The local contest was sponsored by the Woodbury Medical Center. Way to go, Taylor! I'm proud of you!!! congratulation to these students on their work and awards! as someone whose father died of lung cancer when i was a child,it is very uplifting to see young people on a crusade against the PERNICIOUS EVIL that is TOBACCO.maybe we can all breathe a little easier now that we know our young people are INFORMED and INVOLVED concerning this issue.thank you!